Today's sermon is about being happy. It is about being competitive. It is about influencing people for good. 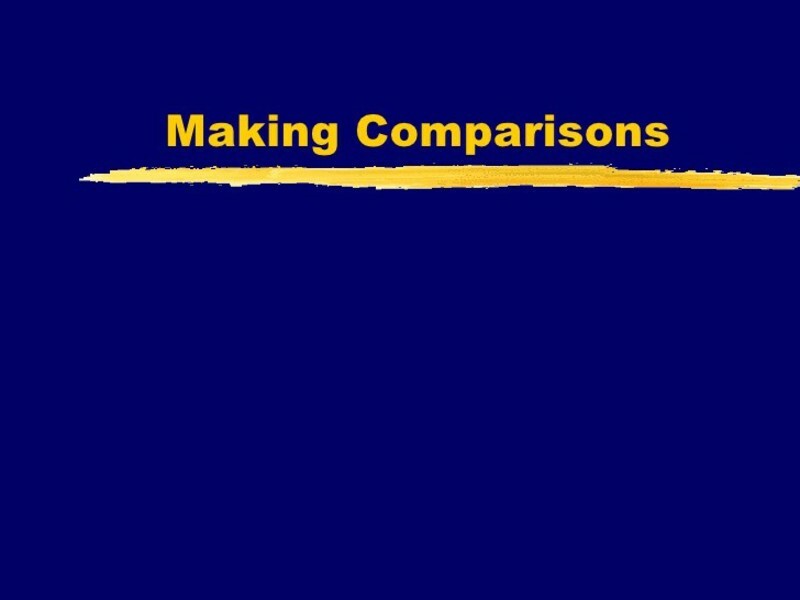 It is about Making Comparisons. What do you think of when someone mentions making comparisons? Good? Bad? It can be both, right? We are trained to make comparisons - by our parents who loved us, our mentors who we admire, and by life's "school of hard knocks". 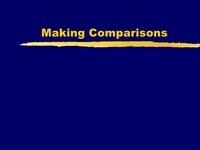 We make comparisons because we have learned it helps us compete in life. We comparison shop by checking prices. We judge the quality of what we purchase to assure we make good choices. We prioritize our needs to be sure we put our resources - time and money - where they will be most effective. We determine who we will work for - based on the quality of life we think we will gain. - whose demeanor is pleasant. Today's sermon is about understanding the limits of making quality comparisons. To be happy and healthy, we must understand that there will always be people smarter, better looking, richer, faster, who seem luckier, and more talented than we are. This is no reason to be upset, sad, or discontent. For God designed each of us differently - gifted us differently, with forethought, to be successful in our own planned purpose . So we can admire what others are capable of doing and use their accomplishments to inspire us. … leads to discontent and strife between ourselves and others. We are told in Proverbs that this type thinking is nothing short of mocking God, our maker. What do we really know about other people's situation? Do we really have to put someone down to raise ourselves up? Can't we be proud of knowing we have accomplished a task to our utmost ability? If it's the right skill (or task) - sure, why not? In life, however, we don't always get to pick the task - do we? We are sometimes assigned tasks we feel we aren't suited for. We 'know' we aren't the best choice. We know we don't want to fail. I can tell you from personal experience, and I'm sure there are others here who can tell you the same, that these challenges (let's call them "opportunities") often benefit us toward reaching what we are really meant to be - what we are really meant to accomplish in life. Feel good in knowing that God's plans for us incorporate our mistakes. … what is important for us - to be of great value to him. "If anyone thinks he is something when he is nothing, he deceives himself. Each one should test his own actions. Then he can take pride in himself, without comparing himself to somebody else, …"
Comparing ourselves with each other in areas where our gifts differ is like comparing apples to oranges. "We do not dare to classify or compare ourselves with some who commend themselves. When they measure themselves by themselves and compare themselves with themselves, they are not wise. We, however, will not boast beyond proper limits, but will confine our boasting to the field God has assigned to us, …." Paul is criticizing those who feel pride by comparing themselves favorably to other peoples. But if we measure ourselves against God's standard (Jesus Christ), it quickly becomes obvious such pride id misplaced. Don't worry about other's accomplishments. Instead, continually ask: "Am I doing the best I can with what God has blessed me with? Am I working hard, with pleasing God as my objective?" Competing in today's workforce is stressful and can be brutal. Our work life tests our willingness to maximize the effectiveness of what God has given us to work with. What I want to convince you of now is that over half the competition at work is actually waged on a level playing field. That field is based on CHARACTER - your character. What I'm saying is that where we may lack the intelligence or good looks we think "must be" required for success by worldly standards, we are all endowed with the same power (by the Holy Spirit) to have Godly character. … Godly character in a friend, an employee, or a business owner, is in big demand. I copied a list of character traits used to define Godly character from a Prison Ministry paper I ran across at one of the men's retreats. They are traits you will recognize as being those that employers would want of their employees - traits that every organization would want of their members - traits that every church would want of its body of believers. As we go though the list, rate yourself - as to where you have been, where you are now, and where you plan to be in the future. Integrity: one who can be relied upon and trusted; one whose word is good. Real success comes from those whose efforts can stand the test of time. We all know people who cheated to pass a course. Weren't they successful? And what about the person who mistreats his workers but gets ahead in business? These 'apparent' successes are temporary. They are bought at the expense of character. Cheaters grow more and more dishonest, and those who hurt others become callous and cruel. In the long run, evil behavior does not lead to success; it leads only to more evil. Moral Standards: They know right from wrong and practice right. Without the moral standards God sets for us, we make up the rules as we go along. In Exodus chapter 23 God warned the Israelites about their neighbors whose beliefs and actions could turn them away from him. We too live with neighbors whose values are different from ours. We are called to maintain a life-style that shows our faith in the standards God has established for the good of man. Honors Commitments; keeping their pledges to do things. We must not make commitments we won't keep - for whatever reason. "Peter asked, "Lord, why can't I follow you now? I will lay down my life for you." Then Jesus answered, "Will you really lay down your life for me? I tell you the truth, before the rooster crows, you will disown me three times!" In our enthusiasm, it is easy to make promises, but God knows the extent of our commitment. Paul tells us, in Romans chapter 12, to not think of ourselves more highly than we ought. Instead of bragging, demonstrate our commitment by growing in our understanding of what we can and cannot accomplish. Responsible for our actions. Being responsible for our actions means our accepting the consequences of them, good or bad. In Mathew 27:24 we read how Pilate washed his hands of the responsibility for his part in crucifying Christ. Although he washed his hands, the guilt remained. Washing our hands of a tough situation doesn't cancel our guilt. It merely gives us a false sense of peace. Fair: just and honest. God's word in Proverbs says that "ill-gotten gain will never be blessed!" Whether we buy or sell, make a product or offer a service, we know what is honest and what is dishonest. Sometimes we feel pressure to be dishonest in order to advance ourselves or gain more profit. But if we obey God, there is no middle ground. No amount of rationalizing can cover for a dishonest business practice. Self-Control: be in control of one's actions and emotions. Peter tells us in 2 Peter chapter 1 to "… make every effort to add to your … knowledge, self-control; …"
False teachers were saying that self-control wasn't needed because deeds don't help the believer. But we are saved so that we can grow to resemble Christ. God wants to produce his character in us - which includes self control. Wisdom: which is the ability to use sound judgment, in following the right course, in all of our affairs. Job stated, in the book of Job, chapter 28 verses 12 and 13, that wisdom can't be found among the living. The ultimate interpretation of who we are and where we are going can only come from outside and above our mortal life. God's wisdom is revealed in the Bible. An interesting example of showing respect is found in the relationship between David and King Saul (in 1 Samuel). David (a man after God's own heart) had great respect for Saul, even though Saul was in open rebellion against God and trying to kill him personally. This respect stemmed from the fact that Saul held the position of God's anointed king. Purity: which is freedom from sin and evil. "How can a young man keep his way pure? By living according to your word." We are drowning in a sea of impurity. Everywhere we look we find temptation to lead impure lives. The psalmist asked the question: How do we stay pure in a filthy environment? He then answers it by saying we must have counsel and strength more dynamic than the tempting influences around us through reading and internalizing God's Word. Remember that what is in the past, is in the past. We can't change it, but God is good to give us a new start in life - to start over - if we are willing to confess our wrongs and change - turning our lives over to him. Gentleness: not being violent, harsh, or rough. Gentleness is often overlooked as a personal trait in our society. Power and assertiveness appear to gain more respect, even though no one likes to be bullied. Gentleness is service based - being considerate, meeting the needs of others, allowing time for the other person to talk, and being willing to learn. It is an essential trait for both men and women. Patient: able to wait calmly for something. Patience, or the lack of it, is an indicator of our maturity level. "Be patient, then, brothers, until the Lord's coming. See how the farmer waits for the land to yield its valuable crop and how patient he is for the autumn and spring rains. You too, be patient and stand firm, because the Lord's coming is near." The farmer must wait patiently for his crops to grow; he can't hurry the process. But he doesn't take the summer off and hope that all goes well in the fields. There is a lot of work to do to ensure a good harvest. We too must practice patience. Trying to hurry things that can't be most often just results in our losing the profit we would have otherwise gained. The fruit of the Spirit is the spontaneous work of the Holy Spirit. These fruits are the by-products of Christ's control in our lives. These are attractive traits in people we deal with. We can have them - by practicing what we preach from God's word. Compassion: which is an urge to help others. The lack of Godliness is exemplified by self-centeredness and lack of compassion. Because God has given us so much, we should feel compelled to give of ourselves to others. An important point to realize is brought to light by Job in chapter 6, verses 6 and 7. Job says that advice is tasteless when people are going through severe trials. Instead, compassion is what is needed. In Isaiah chapter 36:7 we read about a field commander from Assyria claiming that Hezekiah has insulted God by tearing down his alters (in the high places) and making people worship only in Jerusalem. But Hezekiah's reforms sought to eliminate idol worship so that the people worshiped only the true God. Either the Assyrian's didn't know about the religion of the true God, or they wanted to deceive the people into thinking they had angered a powerful god. In the same way, Satan tries to confuse or deceive us. People don't necessarily need to be sinful to be ineffective; they need only be confused about what is wanted or needed. As a note: Drugs and alcohol are common tools of the enemy - used to bring about confusion and chaos. Worthy of Respect: held in high regard. To be respected, we must do respectful acts and deeds. "At this, she bowed down her face to the ground. She exclaimed, "Why have I found such favor in your eyes that you notice me - a foreigner?" Boaz replied, "I've been told all about what you have done for your mother-in-law since the death of your husband - how you left your father and mother and your homeland and came to live with a people you did not know before. May the Lord repay you for what you have done. May you be richly rewarded by the Lord, the God of Israel, under whose wings you have come to take refuge." Ruth's life exhibited admirable qualities: she was hard-working, loving, kind, faithful, and brave. These qualities gained her a good reputation, but only because she displayed them consistently in all areas of her life. Wherever Ruth went or whatever she did, her character remained the same. Your reputation is formed by the people who watch you at work, in town, at home, in church. A good reputation comes by consistently living out the qualities you believe in - no matter what group of people or surroundings you are in. Solid: A person of integrity is a solid person …. firm, strong, and unshakeable in their beliefs. "Please test your servants for ten days: Give us nothing but vegetables to eat and water to drink." Daniel found a way to live by God's standards in a culture that did not honor God. As god's people, we may adjust to our culture as long as we do not compromise God's laws. We can choose who we will work for and, sometimes who we will work with, based on what we think of others. We will judge them against standards we have chosen. But making judgments on others worth is unproductive and wrong. It will lead to discontent (by others if not ourselves). Let's work hard to sharpen our God given skill set's and especially work on our Godly character. Remember God's plans for us will incorporate our mistakes. All we must do is do our best at whatever we work to accomplish. Let's test God's recipe for joy and contentment in our lives by living Godly ones. In conducting our lives, it is human nature to make decisions and then ask God to bless them. Instead, let's seek God's will first - by constantly thinking about the Lord and his way of living. By doing this, we gain insight that will help us make right comparisons and live the way God desires.